This illustrated guide to faeces is perfect bathroom reading. The bright, fan-like Pantone colour swatches are a familiar part of a designer's toolkit. However you probably won't want to use these lookalikes to choose a colour scheme. That's because this pair of Pantone-inspired colour guides are all about, and there's no way around saying this so apologies if you're about to have your lunch, poo. Released by Penguin, these two secretion swatches were designed by Anomaly creative director Matt Roach and illustrated by Douggy Pledger to help familiarise readers with their waste matter. Specifically, one tells parents all they need to know about their baby's nappy fillings, while the other one is an informative guide to help adults understand their excreta. As well as being humorous, the two guides have been medically approved by a gastroenterologist and a paediatrician. So if you've ever been baffled by what you've left in the toilet bowl, think of these swatches as the Rosetta Stone of your stools. Poo can't be blue... can it? Answering all the burning questions that have probably puzzled you at some point or another, these swatches explain why floaters float, why stinkers stink, and the secrets to doing a poo like a pro. Parents will also find heaps of helpful insight as to whether or not it's normal for their baby's poo to look like Dijon mustard, what they should do if the nappy looks like an oil spill's hit it, and why their newborn's doing dumps at all hours of the day. Is that a BONE in one of those swatches? 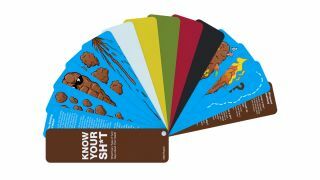 All in all, a whopping 35 different types of poo are covered in these swatches. Perfect for parents and adults with a sense of humour, these guides can be traced back to 2015 when Roach created a POOTONE guide as a gift for Anomaly art director David Lawrie when his first child was born. This baby swatch guide proved so useful that Roach decided to run it by publishers. The adult poo guide came out in the summer of 2018, while March 2019 saw the release of the new baby poo guide.